Closed linear Tissue Processing System with 15 stations for rapid dual (TPC 15 Duo) or triple (TPC 15 Trio) sample processing. 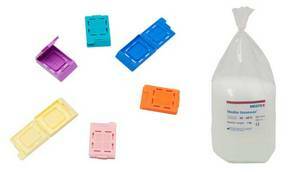 The most cost-effective answer for the tissue processing needs of ever histology laboratory. Parallel processing of two (TPC 15 Duo) or three (TPC 15 Trio) different embedding programs or fast biopsies in less than one hour makes the system indispensable to all lab professionals who need immediate results. The TPC 15 Duo/Trio is a high-production multi-protocol tissue processor with 15 stations capable of processing two (TPC 15 Duo) or three (TPC 15 Trio) different runs simultaneously and independently. The TPC 15 Duo/Trio is the result of years of retro engineering. With a maximum capacity of 440 (TPC 15 Duo) or 660 (TPC 15 Trio) specimen cassettes the TPC 15 Duo/Trio is a multi-processing workhorse. To protect user and environment, the instrument is closed by a stainless steel lid. The TPC 15 Duo/Trio includes an extraction sytem for solvent fumes with the connection to an external exhaust facility. Additionally, the instrument is equipped with a large activated charcoal filter, the use of which is computer monitored. Heaters and stirrers are controlled to provide optimum energy saving. By moving the specimen instead of the fluid, this powerful instrument provides unsurpassed reliability and true multi-processing. It uses up to 30 % less reagent than commercial fluif transfer processors. Due to its highly resistant stainless steel surfaces and containers the TPC 15 Duo/Trio works with all reagents common for tissue processing thus leaving the choice to the user. The large display shows all relevant data for the operation of the instrument in detail. During the running process the status of each program can easily be checked at a glance. The processing temperature is individually adjustable for every station and the integrated safety cut-out prevents the samples from overheating. The programs can start from every station. 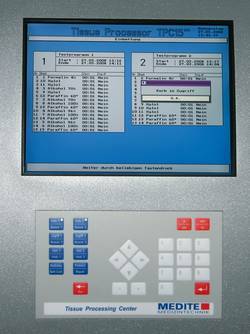 The high flexibility of the software allows programming of short, day, overnight and weekend runs. MEDITE offers a great variety of embedding cassettes and molds as well as specialized MEDITE PURE™ Paraffin, our embedding medium in pellet form for application with all intermedia.